Gaze into the Black Canyon of the Gunnison on a chilly Colorado night and you’ll understand how this 53-mile-long canyon got its name. The roar of rushing water emerges and an occasional flash of moonlight on a wave crest, but the walls and bottom of the canyon are sunk in chill-inducing darkness. Even on a bright summer day, the canyon presents a dizzying course in the geology and history of the area. The bedrock of the canyon was laid down in violence. About two billion years ago, mud and volcanic ash settled in the area. Heat and pressure from layers settling on top, and volcanic thrust and twisting pressure kneaded the mass into a hard black gneiss and schist. Cracks opened over time and magma squished up, cooling finally into pinkish pegmatite, creating the Painted Wall that is the highlight of a sightseeing visit to the canyon. An uplift of a huge hunk of the earth’s crust funneled water into what would become the Gunnison River. The steep drop of its course (95 feet per mile on average) gave the Gunnison awesome force. The rushing river sliced through softer rocks until about two million years ago it encountered the unyielding Precambrian “basement rock” – a literal clash between a rock and a hard place. Unable to erode a broader, more meandering path, the river was forced into a battle with the rock below. Slowly, at a rate of about an inch every hundred years, the Gunnison dug a magnificent canyon 2,250 feet at its deepest point. In 1900, desperate for water for the arid Uncompahgre Valley, five surveyors tried to boat through the canyon to explore the possibility of tapping the river for irrigation. A month into the journey, they agreed with the previous visitors and gave up. A year later William Torrence and Abraham Lincoln Fellows made another try in rubber rafts and with supplies lowered from the rim above. In 33 days, they emerged from the canyon triumphant. In 1905, a remarkable engineering task began – a tunnel to divert water from the Gunnison. The 5.8-mile tunnel slowly inched toward completion and in 1909 President William Howard Taft arrived to celebrate the achievement. In the 1920s local citizens began petitioning for National Park status to protect the Black Canyon. 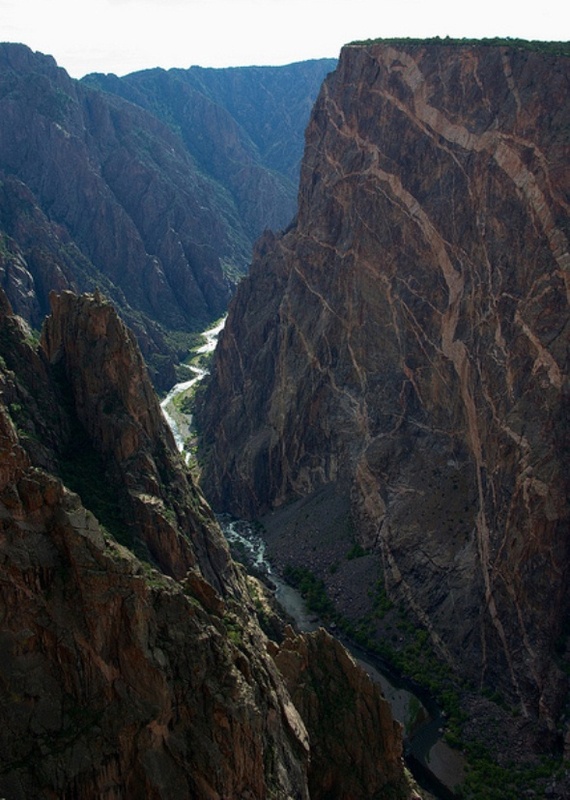 In 1933, President Herbert Hoover designated the most extreme 14 miles of the canyon and its river and surrounding natural area as Black Canyon of the Gunnison National Monument. It was designated a national park in 1999. The park lies 250 miles southwest of Denver, between the towns of Crawford and Montrose. U.S. 50 leads to the more developed South Rim and Colorado 92 to the gravel road along the North Rim. Each route offers many chances to stop and admire the work of the Gunnison River and the striped canyon walls that display the forces that built the region. The South Rim of the canyon has 12 overlooks, most requiring a short walk, extending the seven-mile drive into a two- to three-hour journey. The South Rim Visitor Center, two miles from the South Rim entrance to the park, offers educational displays, restrooms and is open 362 days a year (closed Thanksgiving, Christmas and New Year’s Day). The South Rim Road is closed in winter beyond the visitor center. The North Rim Road, which offers six overlooks with views of the steepest canyon walls, is closed in winter. There is no lodging in the park, and no food or gasoline is sold in the park. Campgrounds on the North and South Rim offer a rustic experience, with vault toilets, tables and grills and water brought in by truck from mid-May to mid-September only. Twenty-three sites on the South Rim offer electric hookups and seven can accommodate large RVs, but there is no dump station and generators can’t be used. Call 970-641-2337 for more information and reservations. Campgrounds are open mid-May to mid-September, with the exception of 34 sites on the South Rim that are open year-round. There are seven hiking trails along the rim of the canyon, ranging from an easy 1/3-mile loop to a moderate five-mile trail past birding areas. The rim welcomes snowshoers and cross-country skiers in winter months. Only seasoned hikers should attempt to walk the riverbanks far below. Even the most used routes from rim to river are a challenge – steep and rocky. There are no maintained trails at the bottom of the canyon, and the park service warns ominously that hikers should be prepared to “self-rescue” in case of mishap. The Gunnison River remains aggressively fixated on its rock-chiseling course and the water is icy. There are a few campsites by the river, but campfires are not allowed and hikers are expected to pack out all their trash and waste. It is possible to drive to the river along the East Portal Road from the South Rim. The road is steep with tight switchbacks. Vehicles longer than 22 feet are prohibited. Only expert rafters can handle the difficult rapids and long portages through the canyon. Downstream from the national park the river is slightly more congenial, with rapids of Class III and IV. A free permit is required for all off-trail and river activities and rock climbing, so rangers can keep track of park use, share park rules and keep an eye out for visitors who venture into the backcountry.